The Iberis sempervirens also known as the Perennial Candytuft grows best in early spring when the frost is still present. It blooms in large white flowers which cover the tiny leaves for the whole period. During this season, the Snowsation Candytuft blooms. It becomes the center of attraction in the garden. It cascades over rocks to form a lush cover of green, sparked with white flowers. On average, it grows to 6 to 10 inches tall with a spread of 10 to 12 inches wide, making it an excellent evergreen ground cover plant. The snowsation plant does not need too much tending. Unlike other members of its family that require constant care, this plant grows uniformly and flowers the same way. It is evergreen with a deep green hue on its leaves. Apart from the period when its flowers overshadow the tiny mounded leaves, it stays green and hardy throughout the year, without seeming to suffer from the apparent change of seasons. The dwarf evergreen candytuft is a darling for gardeners wherever they grow. It is easy to tend to and survives the drought when it is firmly entrenched into the soil. It’s biggest show off is the fact that it flowers evenly during spring, and needs very little tending. You just need to do some little pruning after the blooming period. Otherwise, you just leave the plant to its own ways. While planting this flower, make sure that the area it is located receives maximum amount of sunlight. Better still, plant it directly in the face of the sun. This is the best way to achieve maximum growth for the plant. It also has a preference for soils that are well-drained. Clay soils do not help its growth at all. 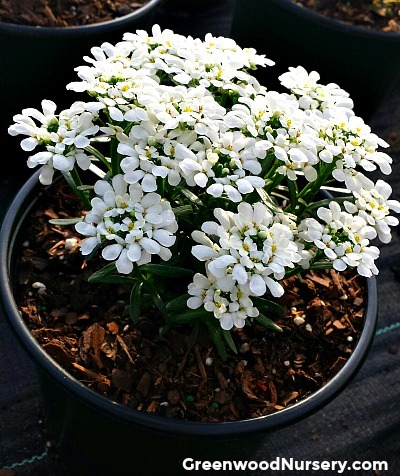 You can use this dwarf candytuft plant as a border plant for your garden, a cover for rocky areas because it covers the ground pretty well, or as a container plant if you do not have a lot of space to set up a garden that allows it to flex and spread. Snowsation Iberis is grown in one gallon (trade size) containers.